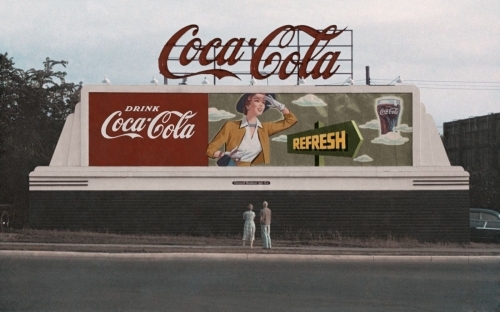 James Rosenquist and his mother admire one of the billboards he painted in Minneapolis in 1954. Image courtesy the Estate of James Rosenquist. He got the job, and spent the summer of 1953 painting signs for Phillips 66 gasoline on the sides of barns that dotted highways stretching from Wisconsin to North Dakota. Writer and curator Judith Goldman, who organized the current exhibition “James Rosenquist: His American Life” at Acquavella Galleries in Manhattan, considers this minimum-wage opportunity a “lucky break” for the artist. By 1955, Rosenquist “graduated from signs to billboards,” Goldman writes in the exhibition catalogue. The serendipitous summer job would change the course of his life. Rosenquist didn’t move from the Midwest to New York City in 1955 to be a union man, but his continued education in billboard painting proved invaluable to his artistic development, inspiring the materials and techniques he would use for the majority of his decades-spanning career. And after all, it wasn’t that unusual, Goldman said, for an artist to dabble in the commercial sphere. Andy Warhol and Roy Lichtenstein, for instance, both supported themselves with illustration jobs before their art careers took off. During this period, Rosenquist would jump between billboard scaffolds and his own home studio, where he was painting small, gray abstractions. But soon enough, Rosenquist decided to take everything he had learned from painting billboards and apply it to his art. He left the Art Students League and quit his job with Artkraft Strauss to paint full time. He began to produce huge canvases with the same smooth paints he had used on the billboards, incorporating found imagery from advertisements and Lifemagazine, carefully rendering the disparate references in a colorful, sensuous style. While his use of advertisements and magazine imagery might seem directly in line with works by other Pop artists of his generation, Rosenquist took great pains to conceal his sources and complicate their meanings. He culled his imagery from magazines that were 10 years old, in order to evade nostalgia or a direct association with a specific product (to that end, he seldom included the names of the products or other identifying texts in his works). In his 1961 painting The Light That Won’t Fail I, for instance, a plastic comb umbrellas a curious melange of images painted in varying gray, black, white, and yellow tones. A picture-perfect woman in dark lipstick sets her gaze upward toward the comb. Overlapping images abridge her face; what seems to be a clipping from a stockings advertisement overlays the shadow of a hand sensually holding a cigarette. Far from a drudging, pay-your-dues experience, Rosenquist’s time as a billboard painter informed every facet of his life. Years later, the artist loved to regale anyone who would listen with stories about the strange events he witnessed from his perch on Manhattan rooftops, and “what it was like to paint Davy Crockett’s fur hat, Schenley Whiskey bottles, and the lettering for Hebrew National salami,” Goldman writes in the catalogue. Up on the scaffolding, he had a perfect view of America.